January 2015 Scorpio Monthly Horoscope predicts that this will be a hectic month in terms of your drive towards accomplishing your goals. The month is suitable for starting and completing new projects for the Scorpions. Your outlook on academic, spiritual and worldly matters will undergo drastic changes. There will be a conflict while completing your professional projects. Your independence to achieve is strong. However it will be wise to enlist the help of your loved ones. You should be more flexible in your approach and make compromises to suit the situation. 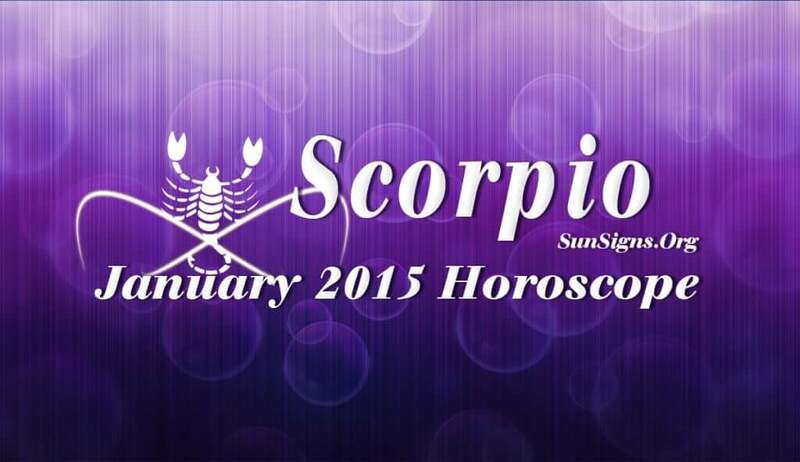 The Scorpio career forecasts for January 2015 foretell that you will be working harder to accomplish your targets. Chances are that you may have to sacrifice high paying jobs and new business ventures in favor of family happiness and harmony. The Scorpio money horoscope January 2015 forecasts an excellent month in terms of finance. Money comes mainly from your profession. Speculative investments will be profitable. It’s better to be prudent to limit your unnecessary spending on new commitments. The January 2015 Scorpio monthly love predictions offer excellent opportunities to get into new relationships which will be linked with your financial pursuits. It may lead to both romantic as well as business ventures. You might even think of getting pregnant or plan to have a baby. Family affairs and domestic concerns will be equally strong as professional career and enough importance has to be given for both aspects. Harmony in family and spiritual life will enhance your success in career. The Scorpio horoscope for January 2015 foretells that your health will be a cause of concern due to professional stress and conflicts at the work place. Sufficient sleep at night and a regular exercise routine will help you maintain your fitness.